Colour photograph of part of the miniature village at Cullen Gardens and Miniature Village. 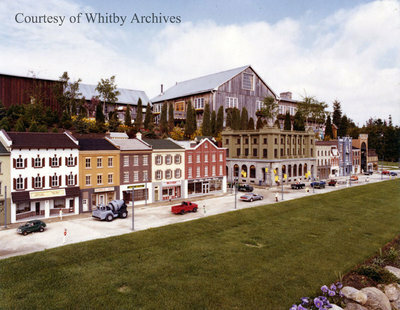 Town of Whitby's major tourist attraction - over 400,000 visitors annually"
Cullen Gardens & Miniature Village, ca. 1983, photographer unknown. Whitby Archives photograph D2016_004_005.